Zone 0 — is inside the bath or shower. Any fitting used in this zone must be low voltage (max 12v) and be rated at least IP67(immersion proof). Zone 1 — is an area above the bath to a height of 2.25m from the floor. 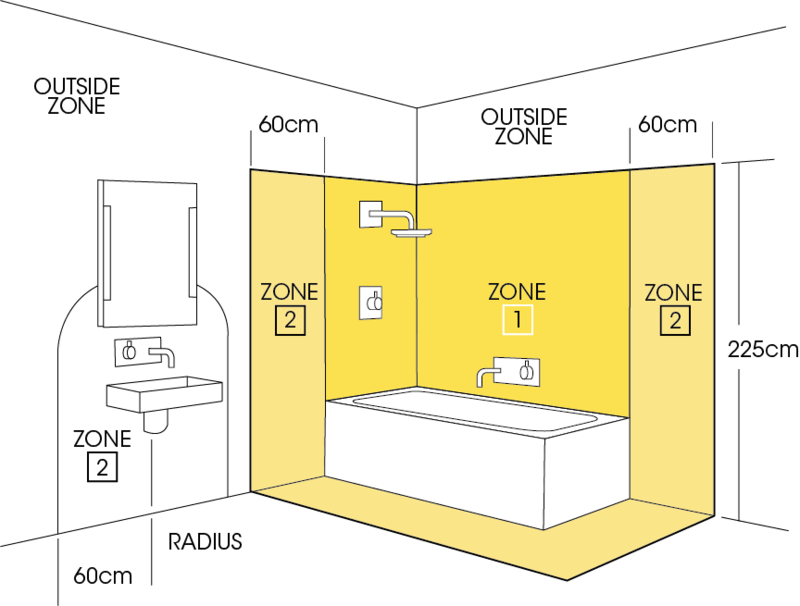 In this zone a minimum rating of IP64 is required Zone 2 — is an area stretching 0.6m outside the perimeter of the bath and to a height of 2.25m from the floor. In this zone a mini- mum of IP64 is required. Around a wash basin, a radius within 60cm is considered as zone 2. Outside Zones — has no special requirements unless water jets are likely to be used for cleaning purposes. All Zones — any electrical circuits in a bathroom must be protected by a 30mA Residual Current Device (RCD). Electrical equipment exposed to water jets for cleaning purposes must be at least IPX5.